Maginhawa is the hodgepodge of note-worthy, up-and-coming bistros and cafes—and it always will be. You can expect a new brand to pop up at literally any spot of this well-loved street. We’ve seen a plethora of ambitious and experimental brands and establishments from food parks, obscure cafes, overhyped ice cream stores, and classic milk tea shops but just as we thought that we’ve seen (and tried) it all, Maginhawa comes knocking us in the gut. Enter the Rainbow Dreams Cafe! 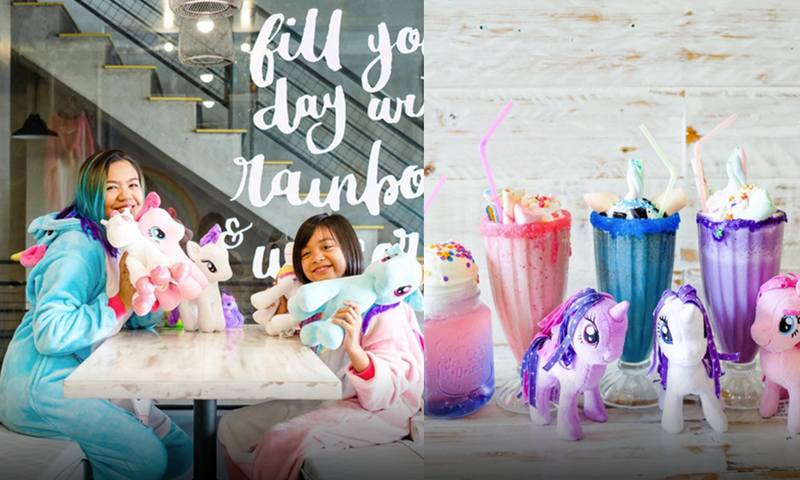 Rainbow Dreams Cafe is the brainchild of Voleyball Superstar Alyssa Valdez and a few of her friends. What Rainbow Dreams Cafe takes pride in offering is not just the satisfying gastronomic experience but also the coziness and playful vibe of the place. You can literally don these unicorn (of course) onesies while eating! When you’re ready to have your order taken, just press the wand that comes with every table. Too cute! Go pay them a visit at #80 Maginhawa Street!